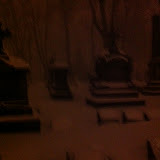 This week, I was fortunate enough to stop by an open cemetery on a very heavy, snowy evening. Unfortunately, I did not have my camera with me. But we did manage to take some interesting shots with camera phones... and found more than one orb floating around the graveyard, as you can see in my gallery. In this very much older cemetery, there is a large house by the gate, inhabited with working lights on, that absolutely belongs in a cemetery. I took a closer picture that sadly did not come out. But you can see it in the background here. I so desperately wanted to capture how the mausoleum, pictured here, looked at me from between the trees. I could hear Robert Frost's words. "The only other sound's the sweep/ of easy wind and downy flake/ The woods are lovely, dark and deep."